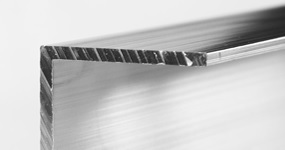 COSMOS ALUMINIUM offers a wide range of standard aluminium profiles: corner profiles, T-type, U-type profiles, strips, rods, round tubes, square tubes, rectangular tubes, etc. The company uses up-to-date equipment and works according to the latest standards in quality, guaranteeing precision and quality that will meet its clients' demanding standards. We stock some of the aluminium profiles in our very own warehouse in Klaipėda. You can look through our range of products here. T6 Grūdinamas ir dirbtinai sendinamas. T66 Ataušintas po karšto deformavimo ir dirbtinai sendinamas, pasiekiant geresnes mechanines savybes, naudojant specialią apdirbimo technologiją.